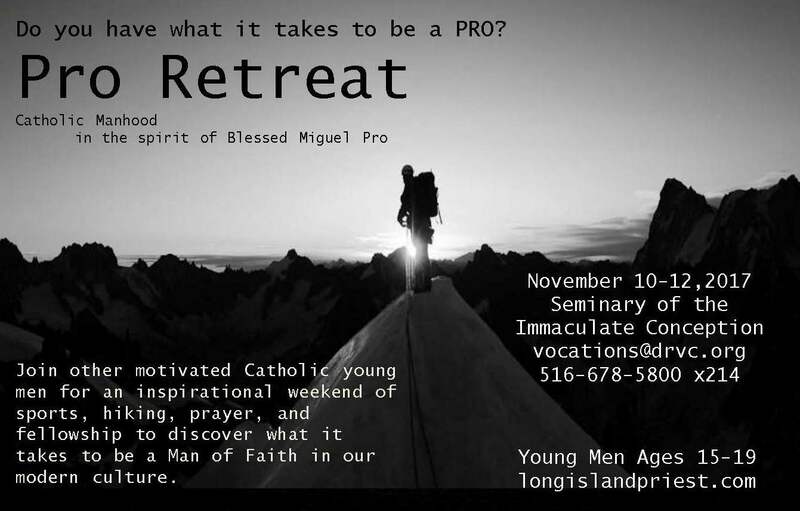 The PRO Retreat is for young Catholic men to look at the life of a courageous young man who loved God and served the Church, Blessed Miguel Pro. He was a Jesuit priest who was martyred during the Catholic Church’s persecution in Mexico during the 1920s. Before he was shot in front of a firing squad, he yelled out holding his rosary, “Viva Cristo Rey!” — Long Live Christ the King! The PRO retreat has had catholic husbands, fathers, seminarians, and priests share about their faith journey to the Young Church of Long Island. The retreat includes prayerful experiences like mass, confession, holy hour, and quiet reflection time, but also sports like football, basketball, ping pong and hiking on over 200 acres of land at the Seminary of the Immaculate Conception in Huntington.